Who Rate All The Pies? The Ship's Cook (aka @the_cookworm) is currently on a pie mission - to find the top rated pie recipes from our nations supermarket suggestions. It started with a tweet we were sent by @jimbolimbo9 suggesting we try two pork pastry recipes from the supermarket Morrisons and from this The Ship's Cook decided to select one reci-pie from each supermarket's website or magazine to make and rate. 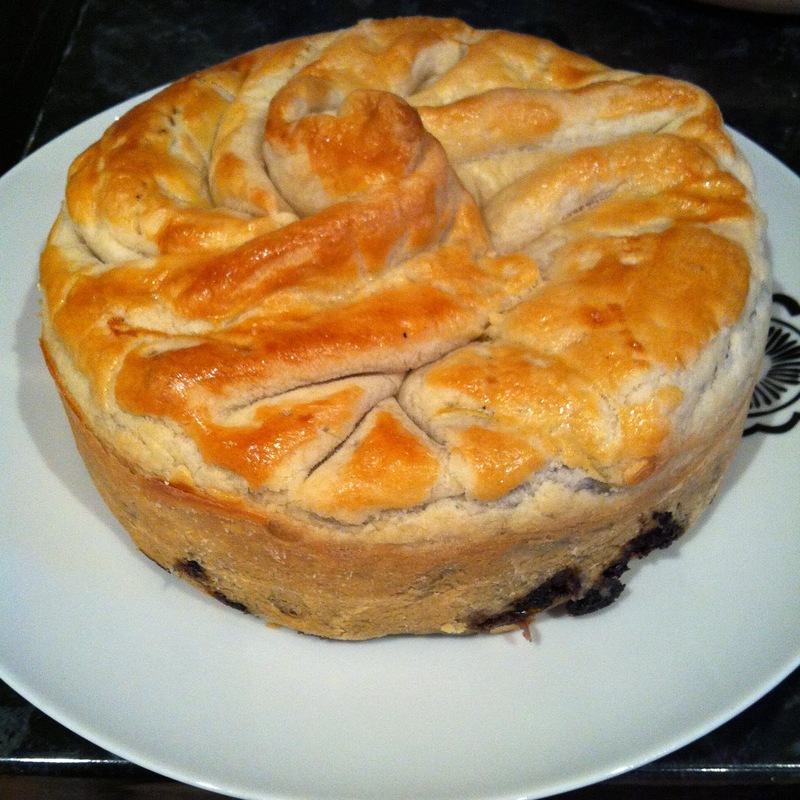 Today is the turn of Waitrose Black Pudding pie! Here is a little-known fact about me: I absolutely LOVE black pudding. I love it so much that I have been known to order items from a restaurant menu that contain black pudding even though I don’t like the other ingredients. So when I spotted this black pudding pie recipe on the Waitrose website, I couldn’t resist making it the second instalment in my supermarket recipe series. This pie was a nice golden brown colour thanks to the egg yolk on top, although I’m not sure the lid was quite as brown and crispy as it could have been thanks to the twisted ‘top-knot’ which made the pastry quite thick and stodgy. Taste-wise, the consistency of the filling in this pie is pretty good. 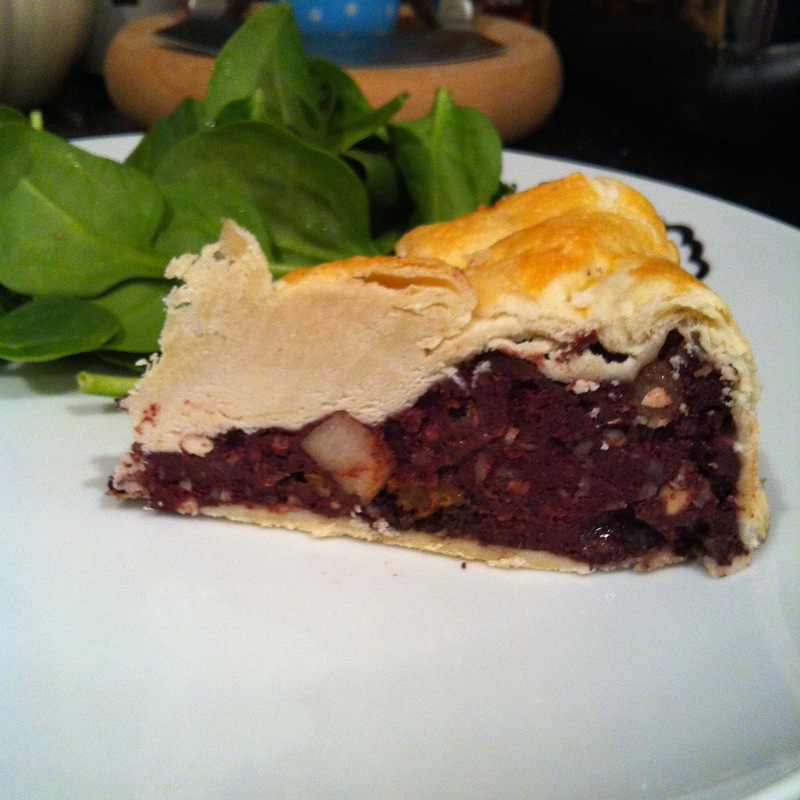 Black pudding and pastry could be a very dry combination, but the addition of the stock and fruit makes it nice and moist, and a little bit saucy/gravyish. Looks-wise, however, the consistency of this pie really isn’t very appealing. 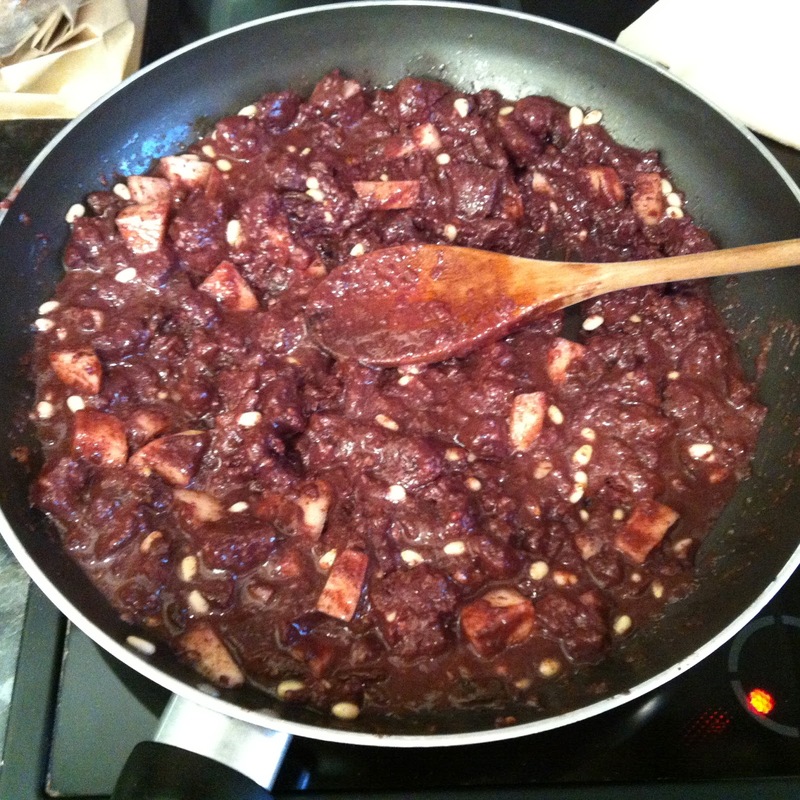 It’s just sort of…browny red and runny and a bit lumpy. It’s not too bad once it’s cooked but while I was preparing it I kept wondering whether this recipe had been a really bad choice. Based on the recipe alone, this pie should score highly for capacity – you use a fairly deep tin, pack the filling in tightly and then cover it with the pastry. If you follow the instructions, however, what you end up with loads of pastry on the top as part of the ‘top-knot’ which messes up the Crust:Filling ratio. I think you’d have better luck not using all the pastry for the lid. 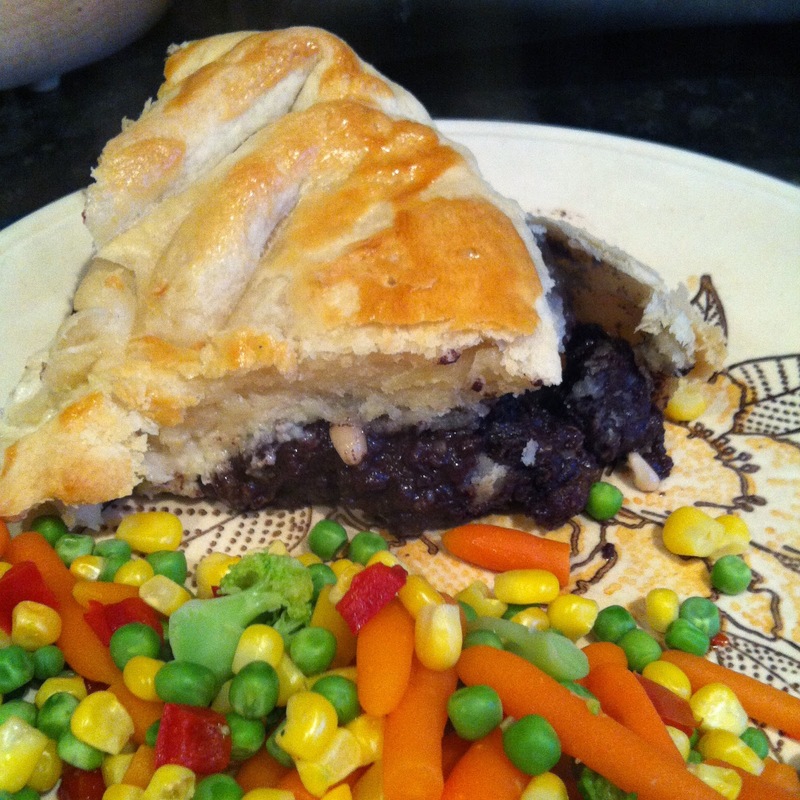 This pie definitely isn’t chewy – the black pudding is cooked down into a sort of mushy puree so it’s nice and smooth. The pine nuts, pear and raisins add a nice interesting texture to stop it from being too smooth. As a black pudding obsessive, this scores pretty highly for me. It’s definitely unusual, and the addition of the raisins, pear and pine nuts adds a nice texture and means the black pudding isn’t too overwhelming. I ignored the suggestion of serving the pie with salad and stuck with veg and gravy, which worked well. 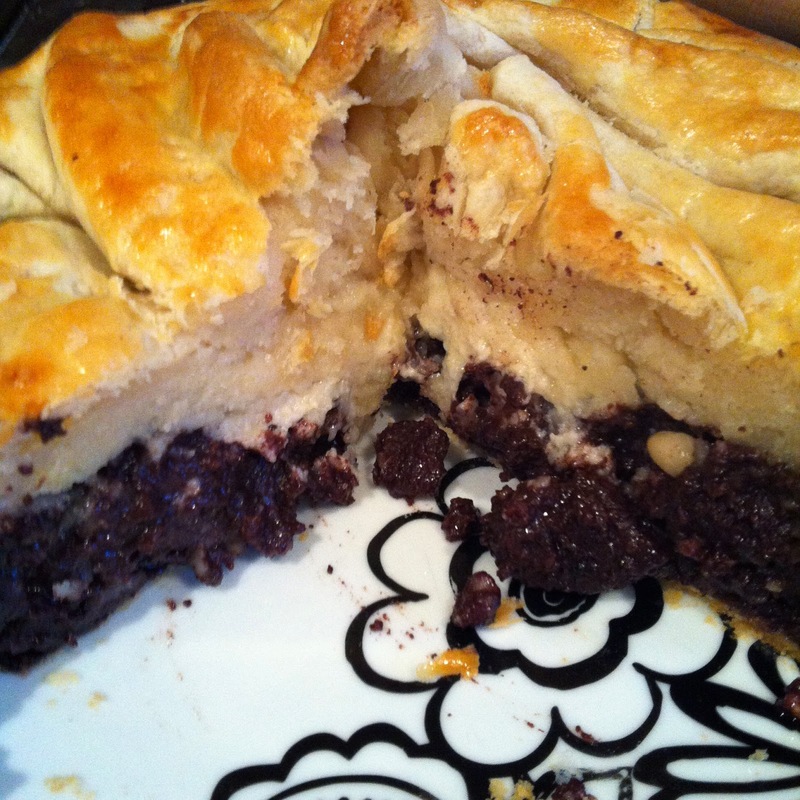 You do have to REALLY like black pudding though, as there’s a lot of it in this pie! This pie looked lovely when I took it out of the tin, but a bit strange once I cut into it. The filling still looked quite unappetising and the ‘top-knot’ of pastry meant that I ended up with really thick, slightly undercooked pastry in the middle of my pie slices. I’m also not sure that puff pastry is best for the base of a pie – I think it needs a more solid base and then a puff pastry lid that isn’t so thick. We did eat some of the cold leftovers the next day and the pie sliced more easily and held its shape, but the weird lumpy pastry top still let it down. Too much pastry in that top-knot, Waitrose! Pierate is a pie review website charting a course to find the ultimate pie. For all the pies we have reviewed have a look at our Pie Rankings or find pies of a particular flavour under Pies: Categorised. Or why not check out the growing list of all the Ship's Cook Pie Recipe Reviews? and let us know your thoughts! Thanks for getting in touch with the Pierateers! Welcome Aboard The Pierate Ship! See our summary of British Pie Week! Find out which celebrities LOVE pie! Read about Pierate's 5th Birthday Pie-rty! Have Marks and Spencer got the Pie Factor?! Pukka Pies save time with microwaveable pie - but at what cost? Pie-in-a-tin: Will it be canned heat or just canned laughter? Frozen microwaveable pie and mash...what could go wrong? Have Nice Pie made a (road) killer pie?! Topping off British Pie Week with a pork pie? A smashing pie at the Badminton in 2015? Pie-athon Challenge - Who Can Eat All Pies? The Pierateers 2012. Watermark theme. Powered by Blogger.